A Tibetan man self-immolated Saturday in protest against Chinese rule in Qinghai province, ignoring new calls by hundreds of Tibetan exiles a day earlier to end the burnings, according to sources inside Tibet. Dressed in full Tibetan traditional attire, the man set himself ablaze and shouted slogans against Chinese rule in Dzatoe (Zaduo, in Chinese) county in the Yushul (Yushu) Tibetan Autonomous Prefecture before he was taken away by Chinese security forces, the sources said. The man, whose identity and other personal details were not immediately available, was severely burnt when he was taken away, the sources quoted eyewitnesses as saying. 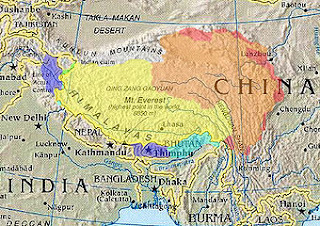 “While burning, he shouted various slogans—calling for the independence of Tibet, inviting the Dalai Lama and Karmapa (another senior Tibetan Buddhist figure) to Tibet, asking for long life for the Dalai Lama and addressing Lobsang Sangay (the head of the Tibetan government in exile) as the King of Tibet,” one source said, speaking on condition of anonymity. Witnesses said they saw his internal organs falling out at the height of the fire before he was bundled away by Chinese police, the source said. It was the 52nd self-immolation protest since the wave of fiery protests began in February 2009, with nearly all of the protests taking place in Tibetan-populated provinces in western China. Most were protests against Chinese rule and calling for the return of the Dalai Lama, Tibet’s spiritual leader who now lives in exile in Dharamsala, India. Sources said the latest self-immolation could be linked to recent local Tibetan protests against the shooting of a film by authorities wanting to portray that Tibetans were happy under Chinese rule. “Few days back, the Chinese authorities coerced the local Tibetans to participate in a shooting of a movie themed on ‘happiness in Tibet,’” a source was quoted as saying by India’s Tibet Express. “The Tibetans resented it and expressed their unwillingness to participate. This incident had led to protest against the Chinese policy,” the source said. The Dzatoe self-immolation came a day after more than 400 Tibetan exiles from 26 countries meeting in India called for an end to self-immolation protests by Tibetans challenging Chinese rule. “Tibet is a thinly populated country, and in the present situation losing even one life is a great loss for the Tibetan people,” said one of 31 recommendations and resolutions adopted by the delegates at the four-day meeting, the biggest in four years. “Please preserve your lives in the future,” it said. Similar expressions of concern from exile figures and from the Dalai Lama himself over the burnings have gone largely unheeded in the past. NOTE—The above article is initially published on RFA website.